Tim Cahill firmly ensured he would go down in Australian football history as their top World Cup star with one of the greatest World Cup goals of all time. In the end it wasn’t to be decisive, as the Australians surrendered a 2-1 lead to the Netherlands, to lose 3-2 and later crash out of Brazil. The Aussies will leave Brazil in high spirits and many more fans than they had before, as sights firmly become set on next January’s homecoming Asian Cup. The high points were instantly recognisable. Written off by the mainstream media; Australia who had performed admirably against Chile last weekend had further ideas rather than just defending and keeping the score down. Netherlands with their menacing attacking duo of Arjen Robben and Robin van Persie were in fine form but Ange Postecoglou had set his tactics perfect to counter a 532 formation that had destroyed world champions Spain last time out. Possession for the first 20 minutes was pretty much shared, with Australia going close in the opening stages through Bresciano and Leckie. However, the rapid pace of Robben was too much for a less than mobile backline. Too easily Wilkinson was turned in the centre circle before Spiranovic was left in no man’s land for Robben to fire the Dutch into a 1-0 lead. Immediately however the Australians stunned the Dutch and set the twittersphere on fire with a truly stunning goal. A first time diagonal ball from McGowan soared over to the often described “one dimensional” Tim Cahill. The New York Red Bulls striker plucked it out the air with such elegance and ferocity smashing it in with his unfavoured left foot off the bar and past a helpless Cilessen for his second of the tournament. The crowd went wild, Australia weren’t the whipping boys everyone assumed, they were here to attack the Dutch. Straight after the break Australia took the lead, substitute Bozanic who had already looked lively minutes before, squirmed into the box before his cross was handled by Janmaat forcing a penalty for the side in Gold and Green. Harsh in some people’s book but the Socceroos weren’t hanging around as Mile Jedinak stepped up to slot coolly into the bottom corner. From then on, Holland shifted into gear and started to bring their A-game to the plate, a great compliment to Australia who had been considered an easy 3 points by many. How the Netherlands’ comeback goals were conceded left a sour taste in the mouth as both were preventable and ultimately individual errors. Van Persie scored his third of the tournament after some disorganised defensive work from left back Davidson that played the Manchester United man yards onside, before Dutch substitute Depay had his long range shot pushed into the inside netting by the continually erratic Ryan. Holland weren’t in the mood to let the Aussies back in and their class finally showed as they stubbornly stayed firm to see out the match. Hours later, their fate was confirmed, Australia were out after Chile made it 2 wins from 2 to join Holland in the final 16. Progression was always going to be an uphill task, but the manner in which they’ve attempted it has been impressive, not just in terms of effort but their final product and technical ability. Further signs that the future looks promising for this fresh batch of Australian internationals. The star on the pitch may have been Cahill in attack with his once in a life time goal, but the real credit should have been directed Ange Postecoglou’s way. Possession based initially in their World Cup preparations, Australia have now shown flexibility offering counter attacking game, a style focused on rampaging full backs, and tonight a pressing game with an emphasis on keeping their wide forwards high up the pitch to force errors. Evolution is a promising ambition, one that will be taken into their final encounter, knowing that a point will guarantee 3rd spot in the group ahead of their world champion opponents Spain. Maty Ryan – 2/5 – At fault for the Dutch winner and continues to panic fans with his out of box venturing. Ryan McGowan – 3/5 – Assisted Cahill’s wonder goal but struggled defensively. Alex Wilkinson – 2/5 – Static and slow, didn’t deal with Robben at all well. Matthew Spiranovic – 3/5 – Sound performance but indecisive in Netherlands’ opening goal. Muted van Persie for much of the game. Jason Davidson – 2/5 – Played van Persie onside for the Dutch second and generally looked less comfortable in possession. Mile Jedinak – 3/5 – Scored the penalty and generally kept possession well. Matt McKay – 4/5 – Impressive running and closing down. Looked always to play it forward. Matthew Leckie – 4/5 – Another fine attacking performance. Had Martins Indi in knots for the whole of the first half. Mark Bresciano – 3/5 – Solid performance in the centre, kept the Aussies ticking. Unlucky to be subbed early. Tommy Oar – 3/5 – A better turn of pace and link up play than his Chile performance. Lacks physicality in such a direct counter attacking set up. 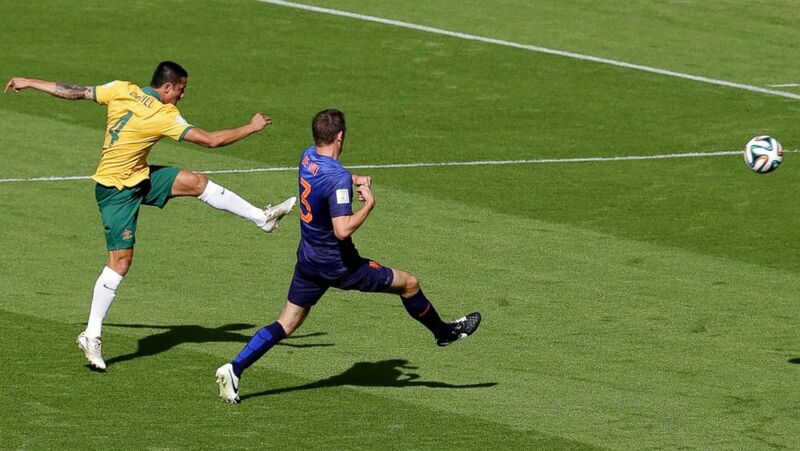 Tim Cahill – 5/5 – Scorer of the greatest goal for Australia in their World Cup history. Always a threat in the air and in 50/50s. Booking rules out a World Cup final appearance against Spain. Oliver Bozanic – 4/5 – Lively performance off the bench. Forced penalty and was Australia’s greatest attacking threat in the second half. Ben Halloran – 3/5 – End product remains an issue but continues to give his all in limited appearances. Adam Taggart – N/A – Brought on late, didn’t affect play. Will likely deputise for Cahill next week due to suspension.